This fall, ESPN launched espnW, or “The Online Destination for Female Sports Fans and Athletes.” While I think the idea is noble, the execution falls flat… again. So far, no one has gotten this idea right. Not Sports Illustrated, not Amy Love, not the NFL, and certainly not ESPN, though the Worldwide is trying — again. When I worked for ESPN Internet Ventures outside of Seattle in the late 1990s, NFL.com was taking its stab at attracting women to its site. So, it launched NFL for Women. Some of the editors asked my opinion. “What do you think of the Tailgate Recipes section?” was one of the questions. My response? Women who like the NFL enough to be on the site probably aren’t looking for recipes. The banners were colored pink, and they went with the Tailgate Recipes and a bunch of other fluff. Needless to say, it didn’t fly. Shortly after the wild success of U.S. women’s teams in the 1996 Atlanta Olympics, Sports Illustrated gave women readers the closest thing to a triumph. The first issue had a pregant Sheryl Swoopes on the cover, and it was called Women | Sport. Johnette Howard wrote a great piece on a predatory youth volleyball coach. The profiles were terrific — Gary Smith style. It looked just like the regular Sports Illustrated, but all the pieces had to do with women’s sports, athletes, and issues that affected women and girls. Two weak-selling issues later, SI decided to take another shot at it. The result was a cross between Seventeen and Runner’s World. 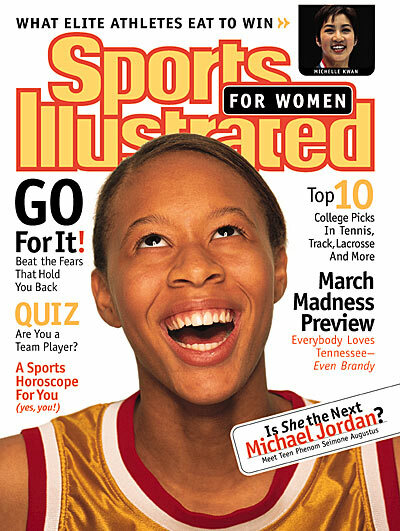 I vividly remember a 14-year-old Simone Augustus on the cover, just her face, a giant youthful smile and her eyes looking up at the bright orange masthead that read “SPORTS ILLUSTRATED FOR WOMEN.” In the corner of the cover was a tease for celebrity picks for the upcoming Women’s NCAA Tournament. I also remember reading “Everybody loves Tennessee — even Brandy!” (Yes, Brandy was always my go-to expert on women’s college hoops!) It showed off the latest in athletic wear, the coolest new sports bras, shoes, boasted fashion advice for the athletic female. In other words, it was a joke. Make no mistake, this is about advertising — not appeasing women’s appetites for sports stories. This is about Nike showing off its new running shoes for women, and Danskin flashing a new sports bra our way. Women who like sports don’t want to read espnW online. They want to read ESPN.com. Trust me, I would love to see more women on the covers of mainstream sports magazines and on the ESPN.com homepage. I enjoy watching and following women’s sports. I think the stories of the athletes are equally as, if not more so inspiring than stories about male athletes. I believe there are huge issues that need to be covered that deal with women in sports — and not in a powder-puff way, nor in a sensitive, candy-coated way. We (women, I mean) read daily about steroids in baseball and what the drugs do to men’s bodies. We read about alleged rapes and the sordid details. We read about cheating, labor issues, BCS nonsense and racial problems. Amazingly, we don’t disintigrate into puddles of offended tears. Thus, I think it goes without saying we can read about predatory coaches in youth sports, eating disorders, or the effects of lesbianism in women’s sports without getting our Jockeys in a twist. Browsing through espnW, I see some stories I really like, like this Outside the Lines piece written by two exceptional female journalists, Elizabeth Merrill and Amy K. Nelson. But note, this story actually ran on ESPN the network and was easily accessible on ESPN.com back in November. So, I don’t really get it. Does that mean this is a story men wouldn’t read? Or does it mean it isn’t important enough to be on the Jets’ homepage? And, if that is the case, does it mean it should be relegated to the ladies room? For the record, the team of journalists ESPN has working on this site is comprised of talented, smart people. It is also apparently working closely with “the official charity of espnW,” the Women’s Sports Foundation, which is a terrific and powerful non-profit organization. Some day, media corporations will take seriously that I am a woman who loves sports and great stories. Some day, they will realize women sports fans go to FoodTV.com for our recipes, NIKE.com for our shoes, and ESPN.com for our fantasy football information. Some day media corportations will stop insulting me as a female sports fan. This entry was posted in Uncategorized and tagged ESPN, espnw, women's sports. Bookmark the permalink. Great article. I have worked in both the automotive and financial industries helping them navigate with smart, professional women. Most women sports fans want to know more about the games, players, etc., not recipes and apparel. At one point, NFL merchandise was designed and sized only for men, but they have learned that women are great fans and have a lot of purchasing power. ESPN and their advertisers need to understand the female fan and what she wants.